Who killed Vincent Chin? is narrowly a story of racism and murder, but broadly its a depiction of the unionized, schlerotic, and dead-end workforce that Detroit had bred even by the early 1980s. Who killed the electric car? veers toward conspiracy at times, but is really a story of the incompetence of the management and workers — of GM and the AW — when it came to adopting new technology. This theme of incompetence is emphasized by Sixty to Zero. It’s written by what is known as a “friendly” or “captive” journalist, basically an a shill paid in access by the industry and in dollars by a periodical. There are plenty of shills across many industries, and this shill’s (Alex Taylor’s) Zhou Enlai-level debasement before the great and powerful allowed him much greater access to Detroit management than he would have otherwise had. No individual leader, no specific reform initiative, seems that bad in retrospect. But they all were either defensive (reacting to change instead of making it), treating changing economic-political conditions (the market share popularity of small cars, and the political popularity of efficient cars) as irritants to be managed rather than as opportunities to drive profits in other areas. The Tesla has a non-unionized workforce, outsells comparably priced BMW and Mercedes models, and has received political largess from both political parties. This more than a decade after GM’s bewildering attempt with the EV1. Instead of building up a business and reaping political benefits, GM’s bad management and political unpopularity led it into bankruptcy and now being shut out of the electric vehicle luxury market. The importance on internal corporate politics, and the inability to recognize new markets, is not unique to GM or the American auto industry. Even generally lauditory books such as histories of Google, Apple, and IBM reveal these issues below the surface. But in GM, you had a company so captured by these problems that progress required waiting for the company ( and union) to burn down financial and regulatory until bankruptcy, to allow new competitors to be born. Without the context of the films and videos Sixty to Zero is a list of names, dates, and personalities. But Sixty provides a context for these films and videos, a skeleton for the flesh, a reason for America’s auto industry’s descent into the ashes and (in Silicon Valley) a promise of rebirth. 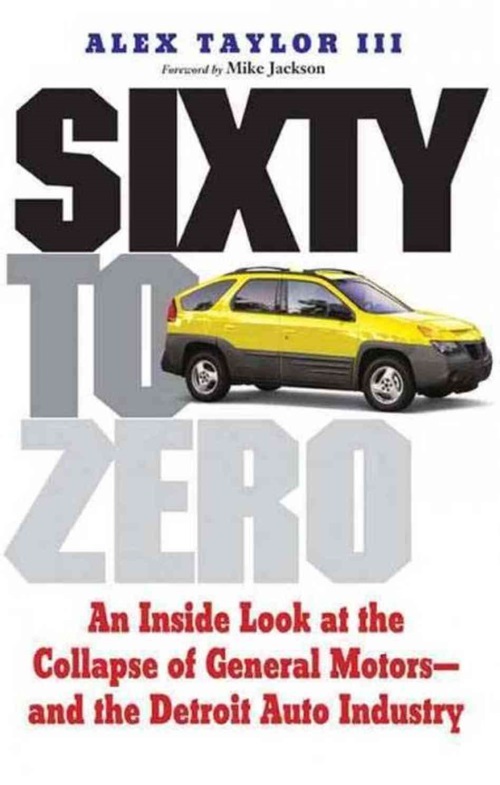 I read Sixth to Zero in the Nook edition. You can read an excerpt at NPR.